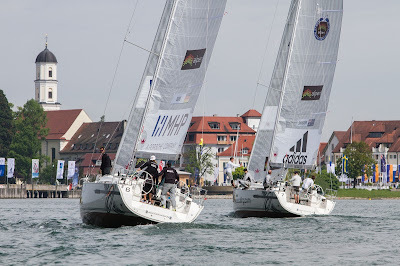 A lengthy day on Lake Constance marked the start of Match Race Germany and the opening round of the 2013 Alpari World Match Racing Tour. 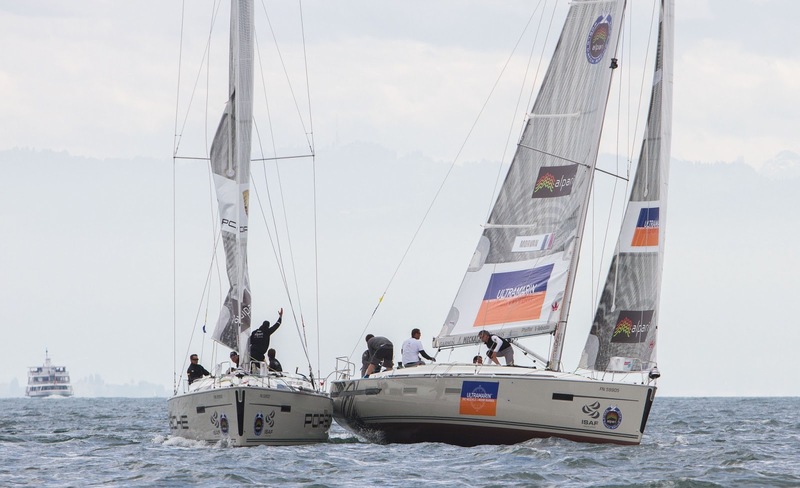 With the wind off Langenargen just strong enough to sail but rarely getting above 10 knots, the organisers ripped through ten flights of the qualifying round, bringing all of the 12 international teams up to five races sailed. With the sun getting low in the sky, at the end of play GAC Pindar skipper Ian Williams and his long term French rival Mathieu Richard of GEFCO Match Racing Team hold a 4-1 scoreline, along with Pierre Antoine Morvan’s Vannes Agglo Sailing Team. The three teams’ single losses were respectively to Adam Minoprio, Bjorn Hansen and Ian Williams. “We were a little nervous because a lot of teams have sailed these boats before and we haven’t,” said Williams. 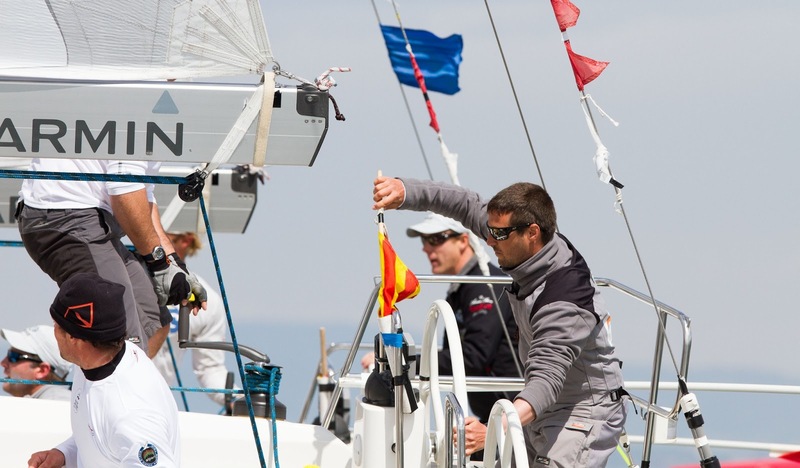 “It is an unusual situation for us to be the less experienced team, but our upwind boat speed was really good.” The GAC Pindar crew narrowly won their match against Morvan after there was a big luff at the top mark and the Frenchman ended up picking up a penalty for going past head to wind. US Virgin Islander Taylor Canfield and his USone team ended the day on three wins along with Keith Swinton’s Black Swan Racing, Bjorn Hansen’s Mekonomen Sailing Team and the Adam Minoprio-skippered Team Alpari FX. In Canfield’s match against Richard there was a long dial up and then, with 1 minute 30 to go, both boats were still a long way over the line but the Frenchman won the favoured committee boat end and it was game over from there. 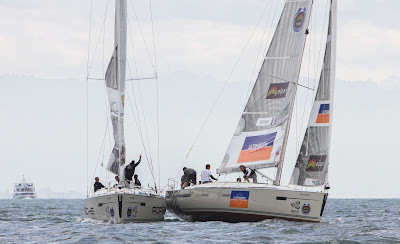 Adam Minoprio’s Team Alpari FX was initially docked a half point for a collision with Pierre Antoine Morvan during a tacking duel in Flight 2, when the stern quarters of the two teams’ boats touched as they attempted to separate. “In my mind it was a port-starboard and he didn’t start avoiding early enough and we had to avoid him and our sterns touched,” said Minoprio, providing his viewpoint of the incident. 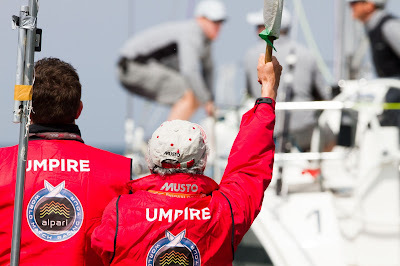 At the time the umpires took a different view and red flagged Team Alpari FX requiring them to carry out a penalty turn immediately, docking the Kiwi team the half point for causing damage. But at a hearing after racing neither Minoprio nor Morvan were found to have broken the avoiding contact rule (rule 14) and the half point penalty was removed from Minoprio’s scoreline. The two German teams of leading Laser sailor Philipp Buhl and German National Match Racing Champion Sven Erik Horsch have yet to get off the bottom of the leaderboard, with Horsch on no wins and newbie match racer Buhl’s only victory taken off his fellow countryman. Johnie Berntsson is also on a single win as is Karol Jablonski.